With so many important elections being held, millions of people, including me, are registering to vote on National Voter Registration Day, September 22. Volunteering with KRC over the next few days at the many outreach opportunities in Los Angeles, Buena Park/Fullerton, and Irvine. Email us at jinkyung [at] krcla.org or fill out this form! 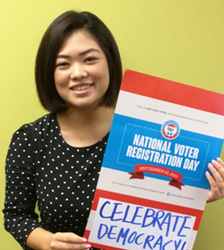 If you represent an organization or want to find events near you, visit NationalVoterRegistrationDay.org and help #CelebrateNVRD!